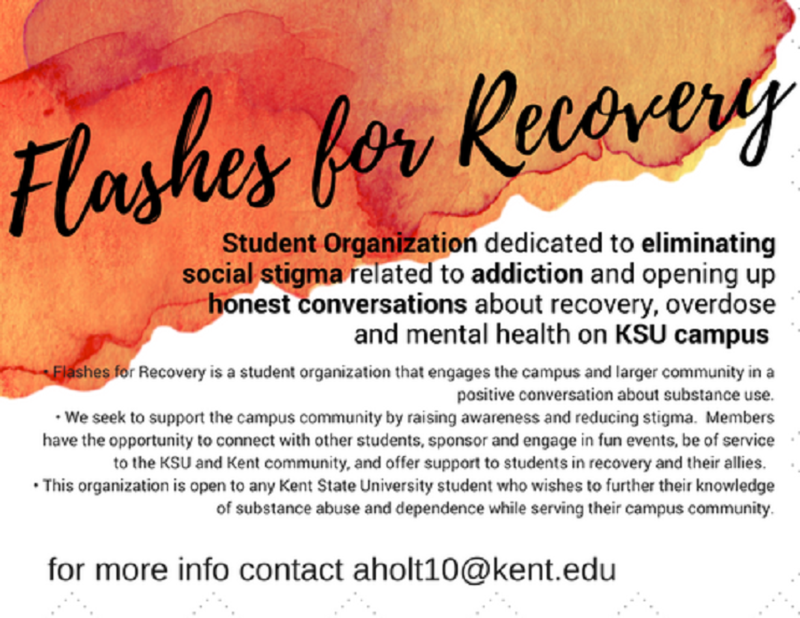 Kent State students seeking help for substance issues have a new outlet with the Collegiate Recovery Community (CRC) on campus. College campuses across the country have their own form of a CRC. These organizations are designed to provide an education on substance abuse and support, so students do not have to pick one or the other. Ashley Holt, the chemical dependency specialist for psychological services, emphasizes the impact a CRC makes on campuses. “The average relapse rate for those involved with a CRC is at 5 percent, compared to the national average of about 60 to 90 percent,” she says. Kent State’s CRC officially started this fall “due in part to a national growing effort to meet the needs of students in recovery,” Holt says. The CRC sponsors two other organizations—Time to Thrive and Flashes for Recovery. Time to Thrive meets every Thursday. It aims to “build community and support wellness” and is strictly a social group. The organization has painted messages on rocks left around campus, watched The Anonymous People and held a Chalk the Walk. Flashes for Recovery meets during the Time to Thrive meeting, but is expected to change as the group grows. The foundation of CRC began two years ago when a student approached the former chemical dependency specialist with an idea to create a support group around students in recovery. From there, another group, Empowering Students in Recovery, was started. Empowering Students in Recovery meets every Tuesday and is a “confidential place for students in recovery or who are seeking recovery to meet up and get support while processing through challenges that they might be encountering,” Holt says. Group generally starts with a check-in to explore triumphs and challenges people had throughout the week, which is referred to as “Flash or Flush.” These sessions may take on a casual or more serious tone, depending on what members want to talk about that week. The CRC also partners with many on-campus and other community organizations such as Residence Services, Portage County Substance Abuse Community Coalition, Counselor Education and Supervision and Kent State of Wellness. Holt seeks to offer campus trainings, events and host other programming to help anyone who needs it. For students seeking recovery, do not be ashamed. For more information on the CRC or any of the groups mentioned, you may contact their Facebook, Instagram or Twitter @KentStateCRC or aholt10@kent.edu.